01.21.2006 - Do you like photos of bats in flight? Sure, we all do! They're hard to get, because bats fly at night, and cameras don't work as well at night. In fact, most people only get to see stray bats here and there, fluttering about vaguely in the dark dusky sky - or flashing around a street lamp. It's not often that folk get to see a swarm of bats. Thus, it can be hard to get photos of bats on the wing. Unless of course one is sitting on the roof of a condominium in which a thousand bats are going in and out. Then it's easy to photograph lots of bats. I like to look at the shots of the bats on the wing. They move so quickly, it's sometimes hard to tell what's going on. In these photos, I can often see exactly how they approach a hole in which they are attempting to land, and how they turn in mid-air. I can see the bones of the fingers with the membrane of the wing stretched out. I can see how they use their hind membrane for balance and maneuverability. Bats are neat, as are most creatures, it's just that they're often a little harder to observe. On this night I worked to remove a colony of bats from a condo. As is often the case, the building has a barrel tile roof. 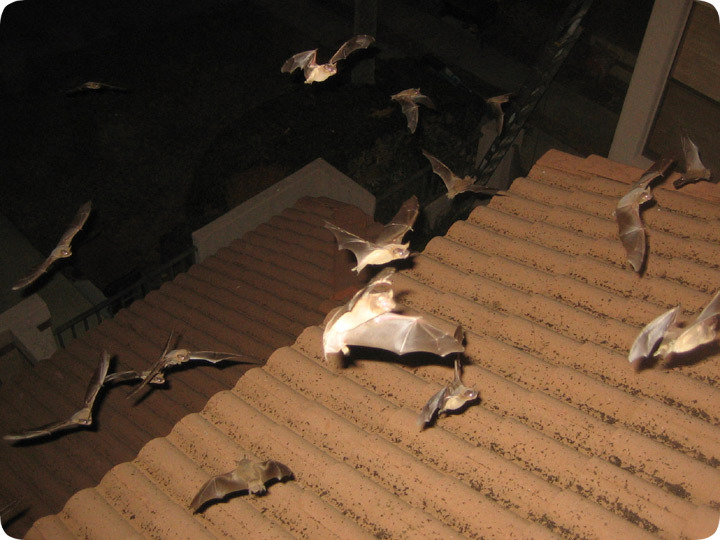 Bats, such as the Brazilian Free-Tails in this photo, love such roofs. In particular, they love such roofs when the builder did not install any metal flashing end-guard at the edge of the tile. Some people refer to this as bird stop, and it's constructed out of any one of several materials, including metal, clay, concrete, and more. If the tiles remain open, they're vulnerable to bat habitation. In this photo, we can clearly see that the bats have been bringing back brown grains of rice, probably for use at a future bat wedding, and depositing them on the roof. Most of this rice they store inside the roof itself, where it cooks and gives off an ever-so-pleasant aroma. Finally the owners of the condo could take it no longer, called the condo association, and had me come out to remove these bats. Remove them I did, but not before I snapped some nice photographs of these fine specimens doing what they do best - bombing buildings with the heavenly remnants of a million pesky Florida insects. With bats, you win some, you lose some. I say you win more than you lose. Bats are dandies in my book.